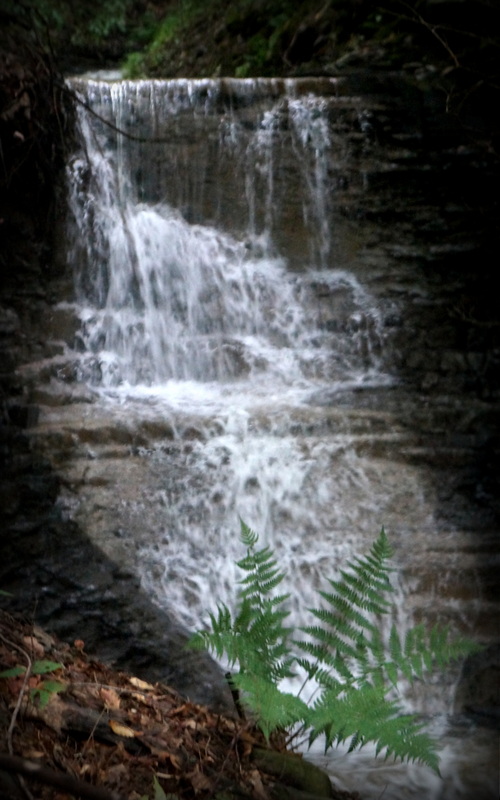 The Black Diamond Trail is for walkers and bikers in the Finger Lakes, near Cayuga Lake. It’s a new railroad bed conversion, running eight miles between Cass Park in Ithaca, NY and Taughannock Falls Park, in Trumansburg. Eventually it will continue south to Treman Park, another eight miles or so. The trail’s name refers to coal – – the north-south railroads in the Finger Lakes generally ran coal from Pennsylvania, to ships on Lake Ontario, and thence to sooty places around the world. This particular route of the Lehigh Valley RR also had a luxurious “Black Diamond” passenger service from NYC to Ithaca, and then on to Niagara Falls. 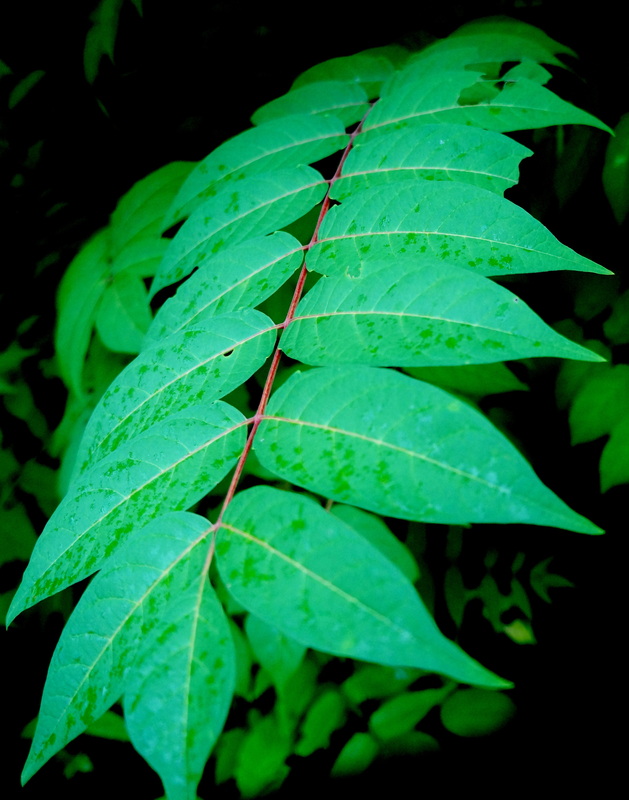 I’ve sometimes been, well, not entirely complimentary about sumacs. In autumn, they’re quite often looking like the tattered and hungover remnants of a Mardi Gras parade. But they’re unfailingly colorful in the fall, and can look pretty darn elegant in summertime, too. The south (Ithaca) end of the trail is a bit dull. Some tiny rivulet-size waterfalls, blackberries, raspberries, Joe Pye Weed, and sumac alongside. A powerline is overhead for a mile, and the cars on Route 89 are visible through the trees. Serious bikers streak past, unsmiling, bug-eyed goggles, spandex and sinew, their tee-shirts advertising an obscure microbrewery in Rochester. 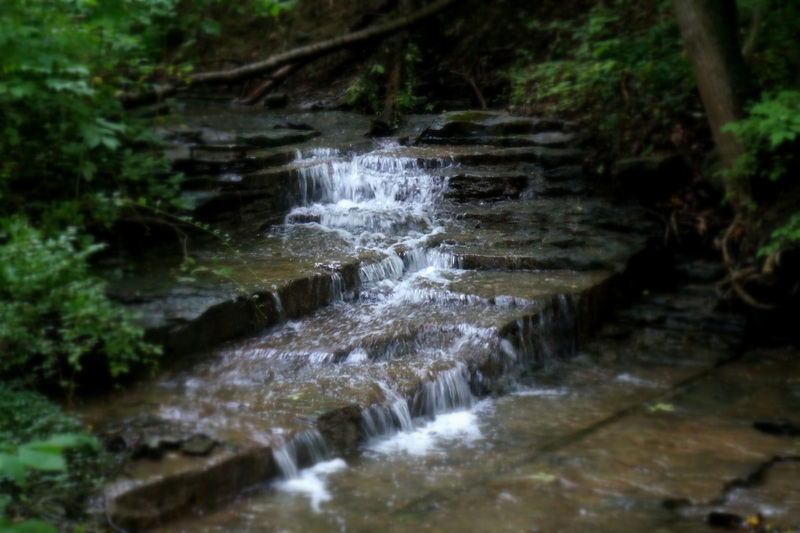 The beers and ales are a bit too hopped-up, and the cyclists too – – pretty much oblivious to the waterfalls, wildflowers and views of Cayuga Lake. The aged hippies from Trumansburg glide by at a more sedate pace, on recumbent bikes or ancient Schwinns, “Uncle John’s Band” and “Jack Straw” audible from their headphones. They wave, stop to look at the little streams, comb a few bugs out of their gray beards, and offer you a sip of homemade kombucha. They’re nice, but I don’t drink, afraid I might wake up under a tree, like Rip Van Winkle, a few decades in the future, a rusty peace medallion around my neck, wearing mossy old bellbottoms, and “California Dreamin” running through my head. A mile or so north of Ithaca, the trail becomes nicer. Most of the pastel-jumpsuit-joggers turn back toward the city. The powerline decides to head west, and it’s just trees overhead. The trail moves farther and farther from the highway. 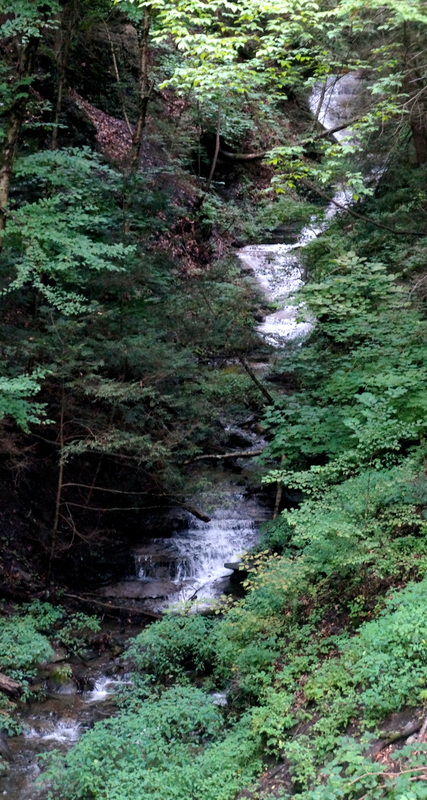 An unmarked but well-beaten footpath goes up the hill, alongside a nice stream with lots of little falls. After a while, as we go up the hill, a sound like passing trains or traffic starts coming through the trees. Past an old picnic area with stone tables, and we’ve come out behind the county hospital. Huge air conditioners are making the rushing sound. 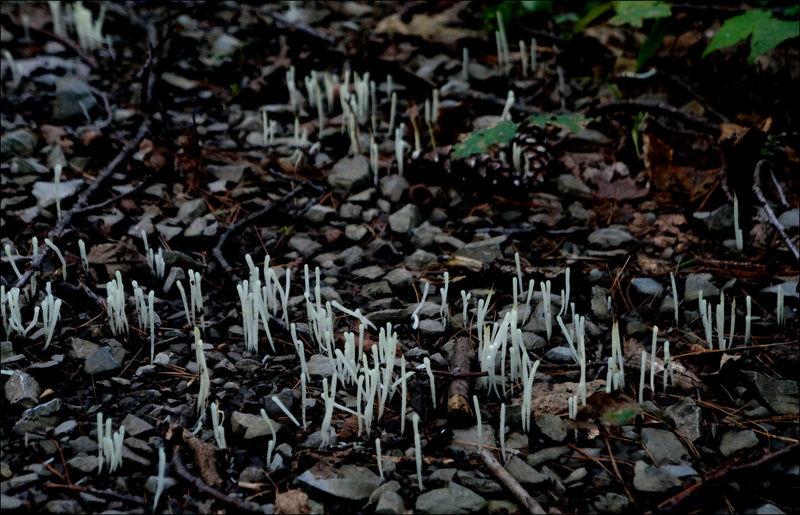 Going back down the hill toward the rail-trail, a side trail is covered with matchstick-sized fungus. Tiny but creepy. They’re unmoving, but we walk around them, just in case. That’s great! 🙂 🙂 I’m waiting to hear about a new job (might be returning to Wisconsin!) but if you’re visiting the area, please let me know! We’ll certainly let you know. Good luck with the new job. I’ll be keeping my fingers crossed. As someone who grew up in that state, I’ll put in a plug, too. People elsewhere often think the whole state is like New York City, but most of it is rural, with many scenic places. If you went up for the Black Diamond Trail, you’d find plenty of other spots to visit. I had already been looking at rail trails in New York State, but Robert’s post gave me a new idea. I find that last picture wonderfully ambiguous. 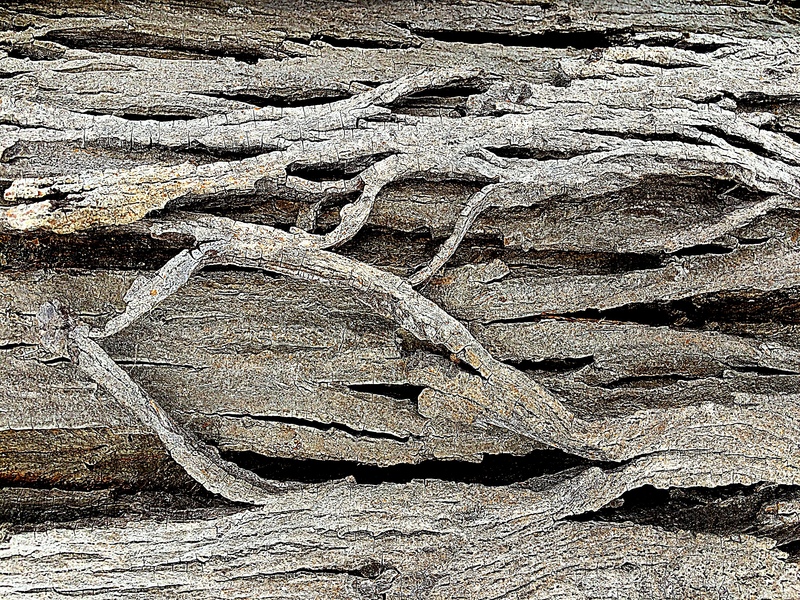 Presumably it’s a closeup of tree bark but my mind is happy to see it as rock formations. As for sumacs, which you rightly observe are “unfailingly colorful in the fall,” we here in central Texas value them all the more in a region that doesn’t have grand-scale fall foliage like you do up there. Yep, it’s shagbark hickory, made a bit grainy. The sumacs are among the best for color, aren’t they, I’ve always wanted to find a stained glass window with them on it. Notice that there’s even one by Frank Lloyd Wright. Your articles always make me laugh. Watch out for the fungus! Beautiful pictures. Taughannock Falls is one of my bucket list spots. There certainly is a lot to observe along the trail. It’s wonderful to see in the autumn, and in really cold weather, when the gorge is covered with ice. It was roaring & coffee-colored last week, when that area got up to ten inches of rain in one day. 10″ is a fair amount. There must have been some flooding. North of Boston got anywhere from 4-8 inches and there was a lot of street flooding and damage to structures. It seems we are in a new world. Sadly, I think our future will see more and more extreme weather. It’s been said that we can’t control the weather but we can have an effect on it and unfortunately it’s not a beneficent one. Nature at its best! I love all of your so skillfully captured images. The fern in sharp focus with the waterfall in the background has the greatest appeal. 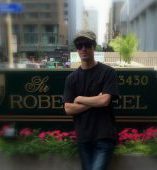 Nice work, Robert! We saw just that one lobelia, and one caterpillar. 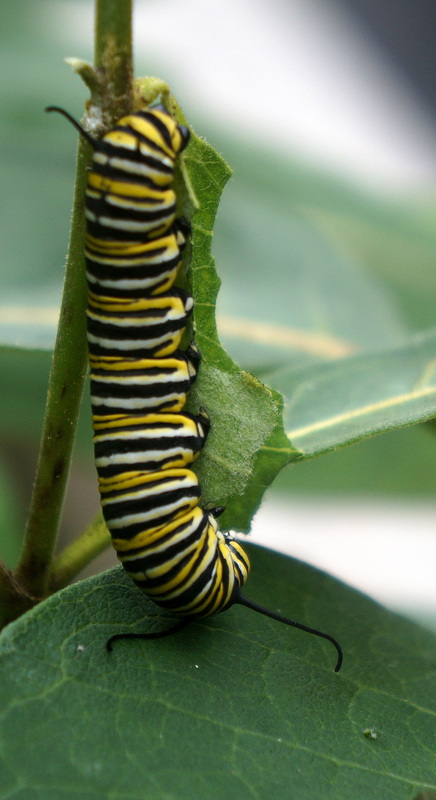 I was surprised to see the caterpillar, because there are full-grown monarchs flying around, but I guess they don’t all hatch at the same time. 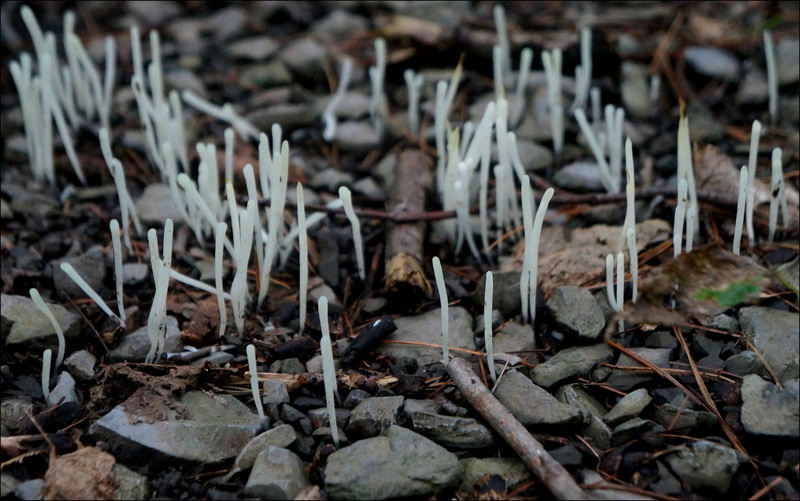 It’s been so wet, there’s all kinds of fungi everywhere. I had a chat with that guy, about eating upside down and acid reflux, but he just kept munching. Definitely happy to see more monarchs around here again, after a couple of scarce years. My sister had a patch of milkweed plants in her garden this year, but hasn’t seen any chrysalises on them. …and we’re having the driest summer on record, so it figures that you’d have too much rain. Extremes everywhere! Lodi, a little village about ten miles north of that trail, got ten inches of rain in 24 hours recently. I guess “extreme events” aren’t just for punk rockers anymore. I’m not sure what it says about me that “Uncle John’s Band” is playing in my mind now: or maybe I do. I never made a concert, or indulged in the ‘refreshments’ offered there, but I suspect a lot of us still have a little Deadhead in our makeup. Here’s a tidbit that makes me feel as though I must be two hundred years old. My grandfather was an Iowa coal miner, and my grandparents’ house backed up to a rail line that ran from the mines to the yards where they’d be attached to trains heading to who knows where: probably Kansas City, Chicago, or points in between. The coal cars were open, and there always were chunks falling off. A lot of people still heated with coal, and we kids would go out with gunny sacks, pick up the pieces, and sell them to people at a deep discount. I can’t remember the price, but I don’t remember ever having a dollar bill except on birthdays or Christmas, so it might have been fifty cents a sack. And we made them empty the bags and give them back to us. Got to keep that overhead down! Now, I’m wondering if those old tracks have been transformed into rail trails. Iowa’s a big hike and bike state, and pretty committed to prairie restoration, so it’s possible. It would be wonderful if they have. Your photos here are a testament to the sorts of delights that can come with efforts like that. I always like the waterfall photos, and the one here with the ‘staircase’ is especially nice. I laughed out loud at your description of the serious bikers. We have them, too, and I always have the urge to sit them down and feed them cheeseburgers until they smile. Linda, I always get a kick out of what you write. I love this idea of a cheeseburger intervention!! I also appreciate these rail trails when we’ve had some really wet weather, because they drain, and you’re not slogging through mud the whole time. My father‘s family came from a coal mining region in PA, One of my great grandfathers was a miner, and there’s still a few anthracite mines going, and trains of course, but the rail trail to Mauch Chunk (re-named Jim Thorpe) is one of the most popular bicycling spots in the east. That little village by the way, years ago obtained Jim Thorpe‘s body as kind of a tourist attraction, and I read somewhere that his family wants it back, to re-bury in Oklahoma with the rest of his kin. I giggled when I read about the Jim Thorpe reburial saga. Did you ever hear the tale of good old Jeremy Bentham, who still gets dragged out from time to time? Yes, it’s funny, I was just watching an old “Inspector Lewis” episode with lots of taxidermied animals. I looked him up on the internet, to see “how he’s been keeping,” and there’s a lot of close-ups of his head on Buzzfeed, his skin looks like dried dates, or a really old sweet potato. Robert this was so very beautiful. I felt cool and calm after this post. All stress…. evaporated! Thanks for this post! I really need to make it to the northeast one of these years. It’s even far enough away to call it a major trip, without the hassle of customs officers. (Of course, I don’t know what sort of customs they have in the northeast). Well, the NE is often rusty and crumbling, but many folks find our local customs to be colorful and entertaining. I may be leaving soon for the Old NW (Wisconsin) but if you organize an expedition, please let me know, I’d love to meet up, and can provide translation services! The fall colors are spectacular, Dave, and there’s great wine and apples, which I know you cannot get out in the NW! This trail seems like a good metaphor for life, doesn’t it? Things get nicer when you persevere, but most turn back before reaching the good stuff. Yes, I hadn’t thought of that, very nice!